Citation Information: J Clin Invest. 2017;127(5):1700-1713. https://doi.org/10.1172/JCI91913. It is well established that somatic genomic changes can influence phenotypes in cancer, but the role of adaptive changes in developmental disorders is less well understood. 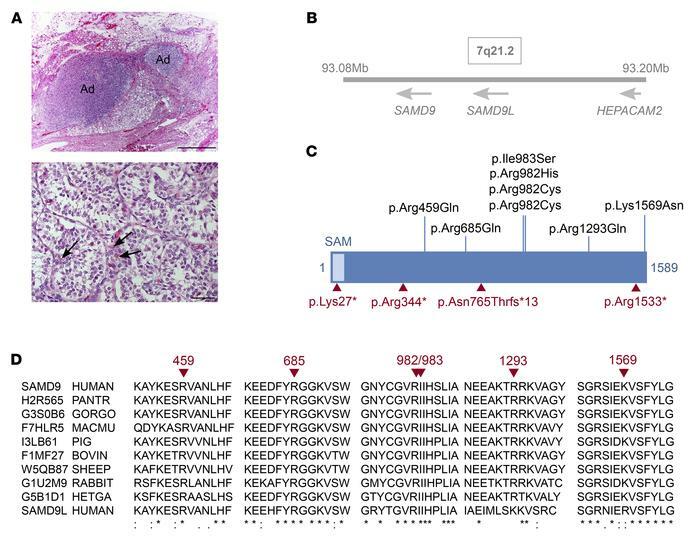 Here we have used next-generation sequencing approaches to identify de novo heterozygous mutations in sterile α motif domain–containing protein 9 (SAMD9, located on chromosome 7q21.2) in 8 children with a multisystem disorder termed MIRAGE syndrome that is characterized by intrauterine growth restriction (IUGR) with gonadal, adrenal, and bone marrow failure, predisposition to infections, and high mortality. These mutations result in gain of function of the growth repressor product SAMD9. Progressive loss of mutated SAMD9 through the development of monosomy 7 (–7), deletions of 7q (7q–), and secondary somatic loss-of-function (nonsense and frameshift) mutations in SAMD9 rescued the growth-restricting effects of mutant SAMD9 proteins in bone marrow and was associated with increased length of survival. However, 2 patients with –7 and 7q– developed myelodysplastic syndrome, most likely due to haploinsufficiency of related 7q21.2 genes. Taken together, these findings provide strong evidence that progressive somatic changes can occur in specific tissues and can subsequently modify disease phenotype and influence survival. Such tissue-specific adaptability may be a more common mechanism modifying the expression of human genetic conditions than is currently recognized. Mutations in SAMD9 identified in 8 patients with IUGR and a multisystem disorder. (A) Adrenal and testis histology from patient 4. Top: Small islands of adrenal tissue (Ad) were identified in perinephric fat. Scale bar: 1 mm. Bottom: Testis showing rare Leydig cells (arrows) between seminiferous cords. Scale bar: 100 μm. (B) The location of SAMD9, SAMD9L, and HEPACAM2 on chromosome 7q21.2. (C) Mutations resulting in increased growth repression are shown in black. Acquired somatic loss-of-function mutations are shown in red. (D) Conservation of SAMD9 protein sequence in different species, with the position of mutated residues shown in red. Human SAMD9 is shown on top. Human SAMD9L is shown at the bottom.